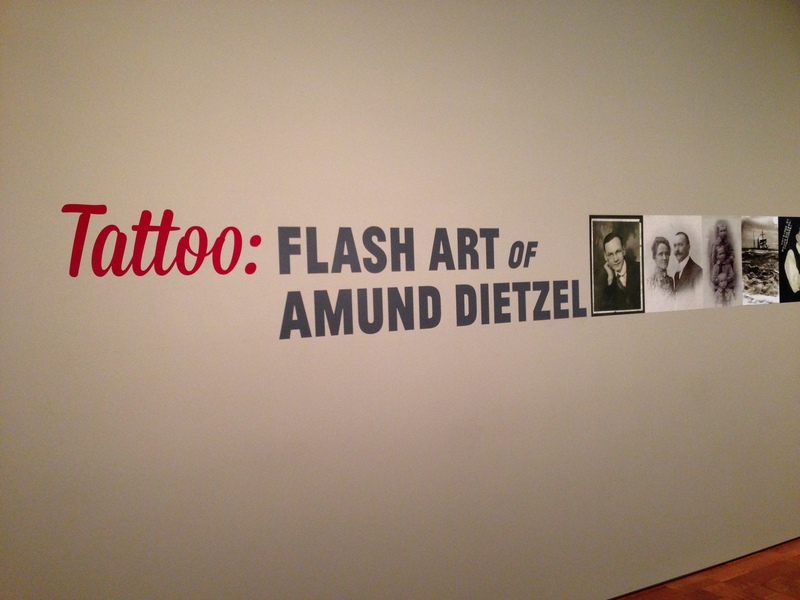 I had the pleasure of taking a quick day trip up to Milwaukee on a crisp and sunny fall day to see the special exhibit Tattoo: Flash Art of Amund Dietzel at the Milwaukee Art Museum before it closed. I wish I had had a chance to see it sooner to get the word out about what a worthwhile show it was to see. So if you have the chance between now and Sunday, October 13 (yes this Sunday), check it out! The exhibit is medium-sized with over 30 framed flash sheets (some of them in the original frames), an early itinerant design book (and its loose leaves, some of which have been framed), a handful of acetate stencils, some pencil sketches, photos, business cards, other ephemera, and two particular highlights for me: a pink art-deco travel trunk and four of Dietzel’s non tattoo-art paintings (the latter of which, sadly, I could not get permission to reproduce here–they are wild! worth the trip just for them). 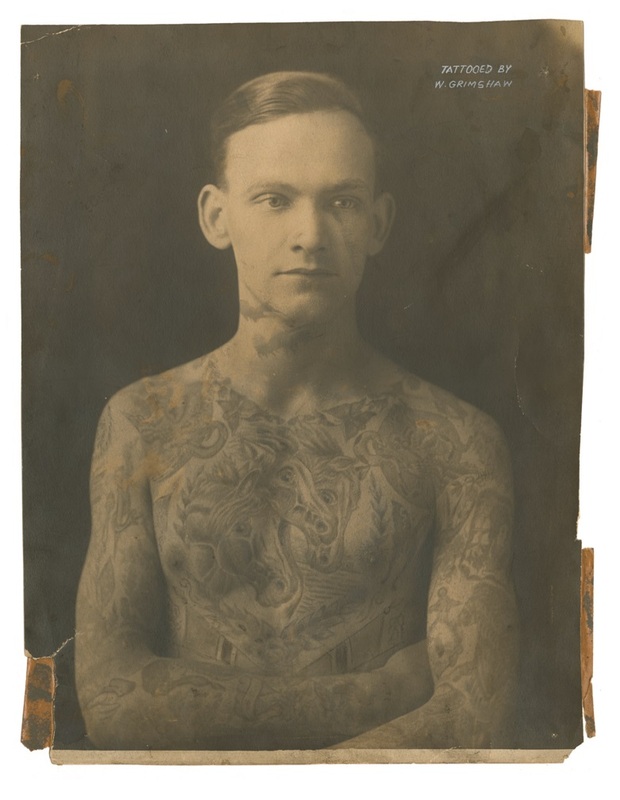 Almost everything in the exhibit comes from the collection of Milwaukee tattoo artist Jon Reiter (of Solid State Tattoo), who has published many of the images in two excellent volumes, These Old Blue Arms: The Life and Work of Amund Dietzel, available here. 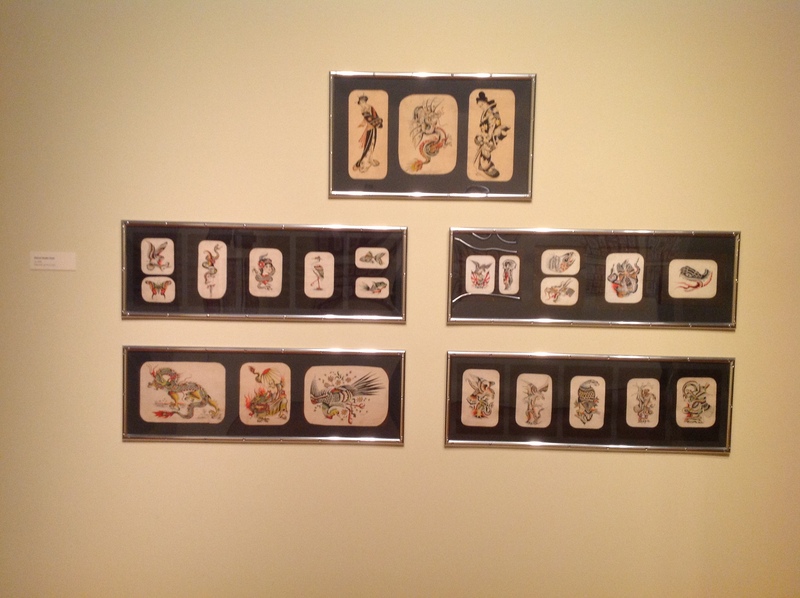 One installation shot showing some of the sheets from Dietzel’s shop; reproduction frames that evoke the extant original ones tie the works together seamlessly. 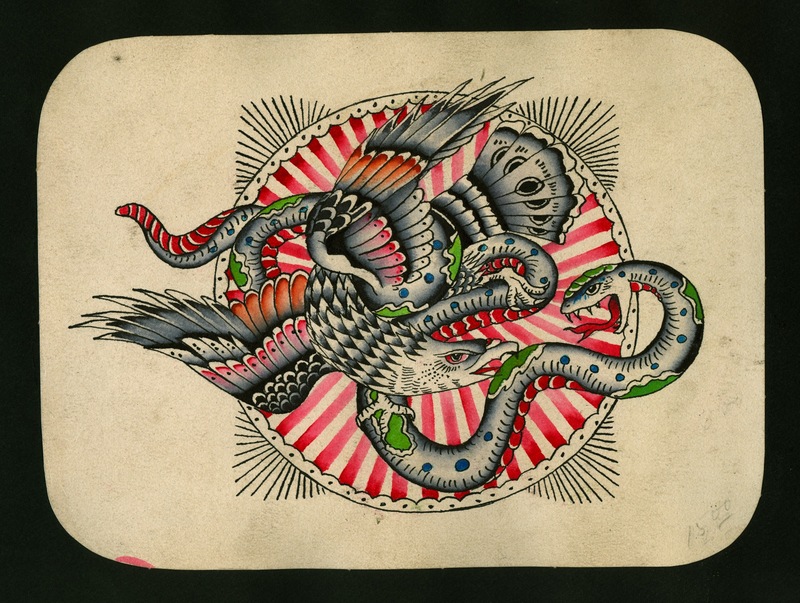 Dietzel’s c. 1927 travel trunk with incredible reverse-painted glass; one of the few items not from Jon’s collection (this is from the collection of fellow tattoo scholar Nick Schonberger). 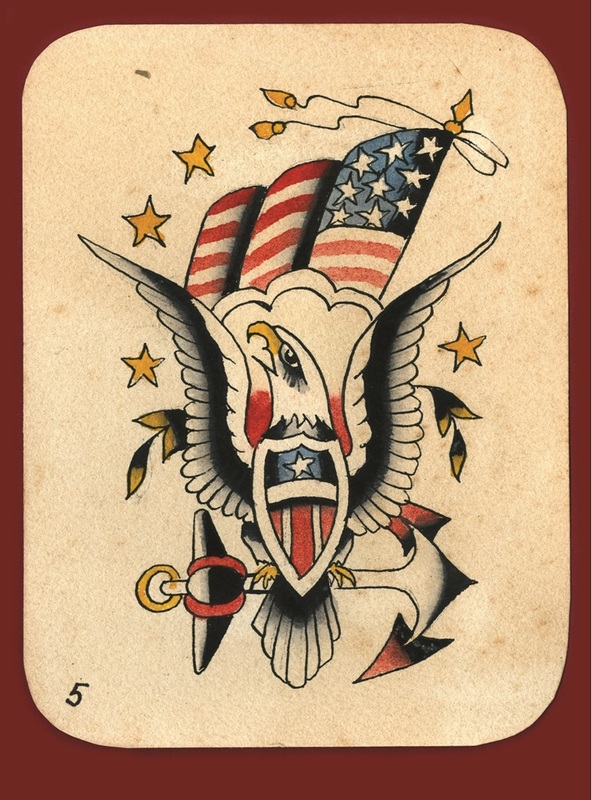 The focus on just a sole tattoo artist (rather than the usual show which mixes historical flash from a variety of artists as, for example, I did with my selection for Intuit’s Freaks and Flash show a few years back) enables a process of tracing changes in style and iconography through a corpus of work and really seeing how a tattoo artist can transform in response to cultural changes and client desire as well as his own individualistic whims. 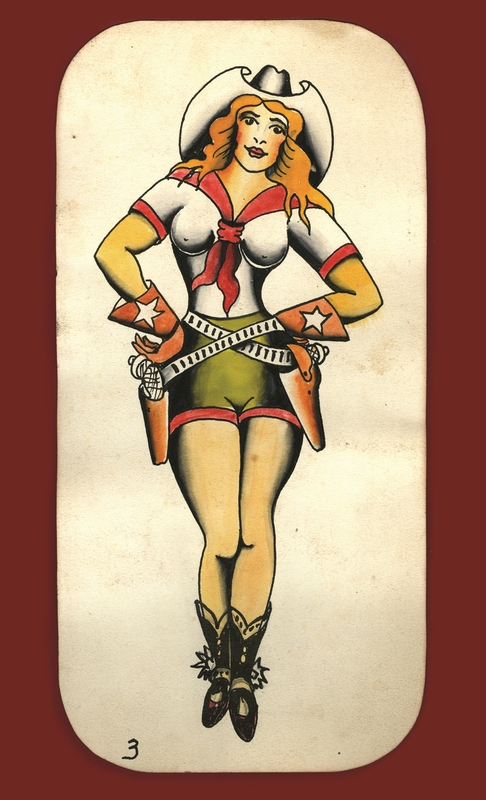 Dietzel’s style notably changed from the early flash from the teens and 20s to the material from the 40s and 50s to the final pieces from the 60s. 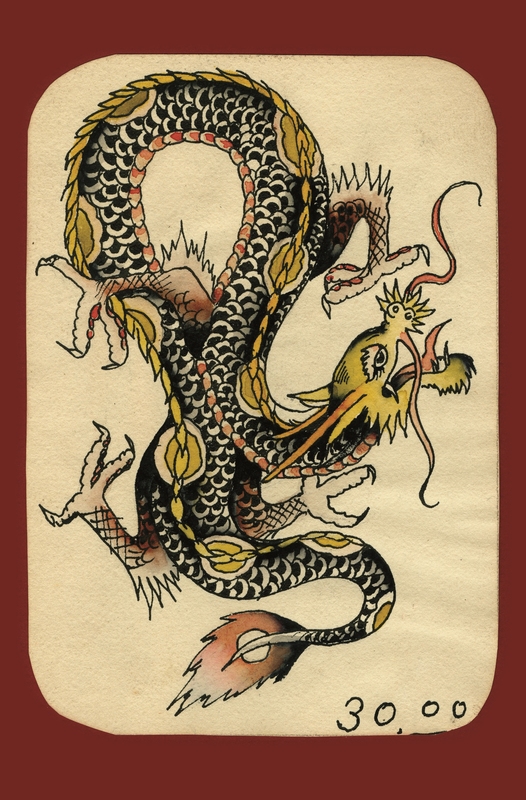 It got bolder, simpler, and less overtly influenced by Japanese work (although his dragons, always a favorite of mine, remained remarkably consistent through his career). I’m left wondering why his style changed. Did he realize that bolder work held up better over time? 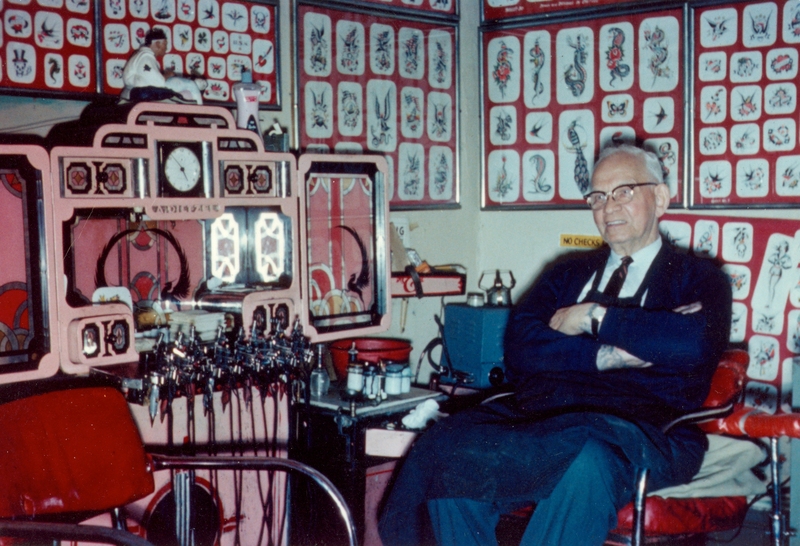 Did his clients desire that particular aesthetic? 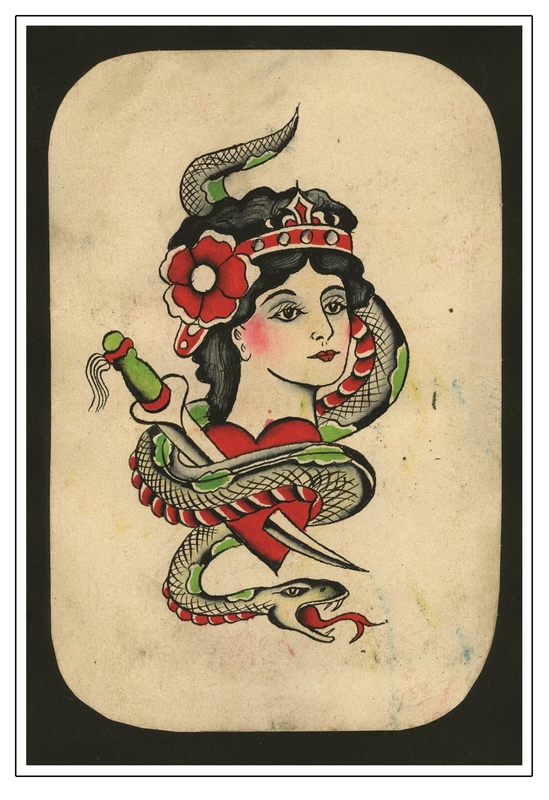 Did he want to create flash that better mimicked what the final tattoo might look like? 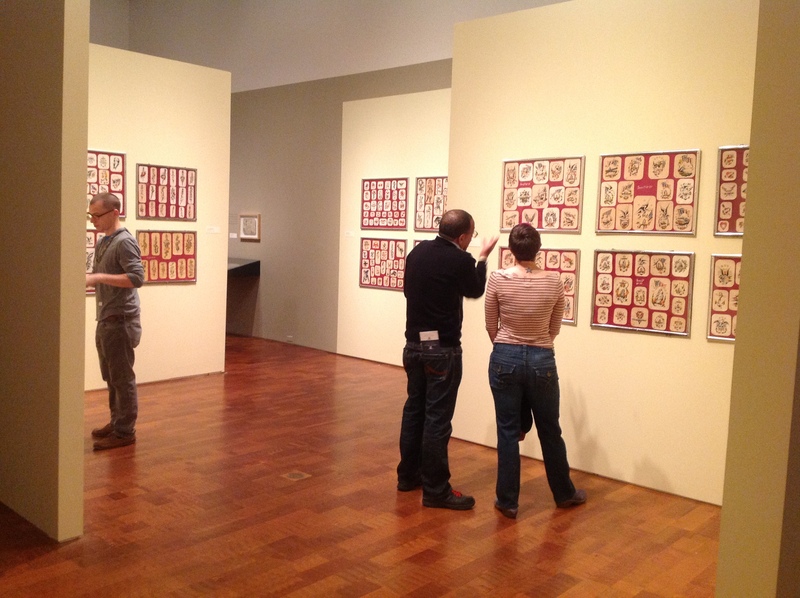 My one big critique of the show from a curatorial perspective was the very limited didactic text. 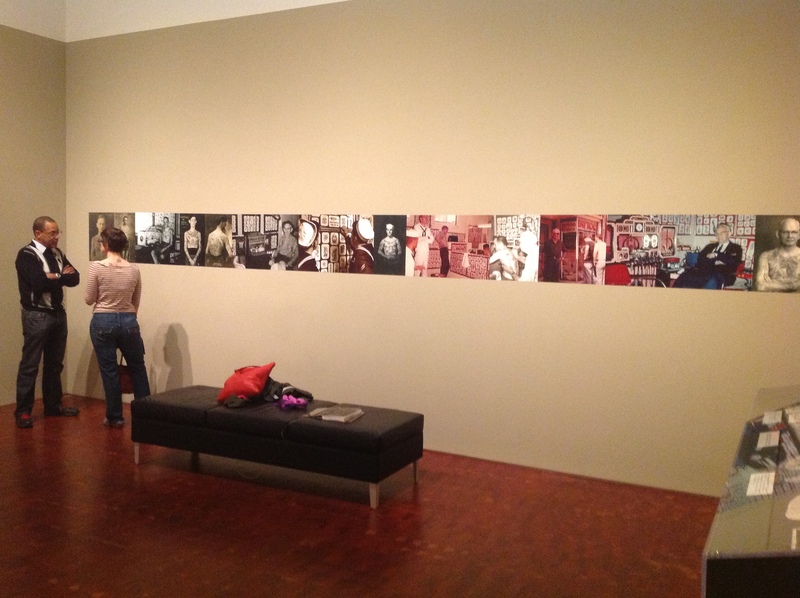 In two places in the exhibit (the intro and the end), large photo-montages of historical images snaked down the walls. But captions for the images were completely absent. 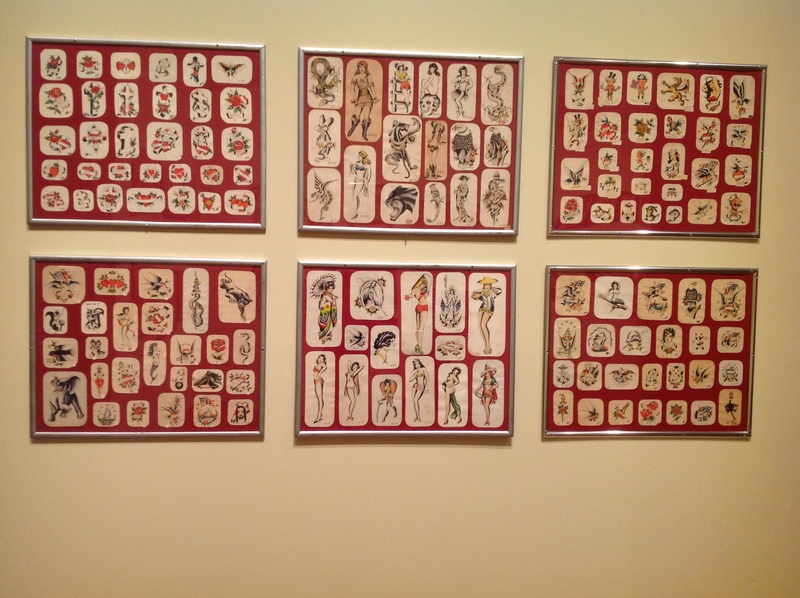 Granted I am a visual historian viewing tattoo flash in an art museum (and thus crave as much information as possible about any image), but I would have loved at least basic information on what these images were. Some I recognized from Jon’s books, but others were completely cryptic (and yes, there was a copy of the book in the exhibit, so I could have looked them up, but that’s a bit too much work for the average visitor). 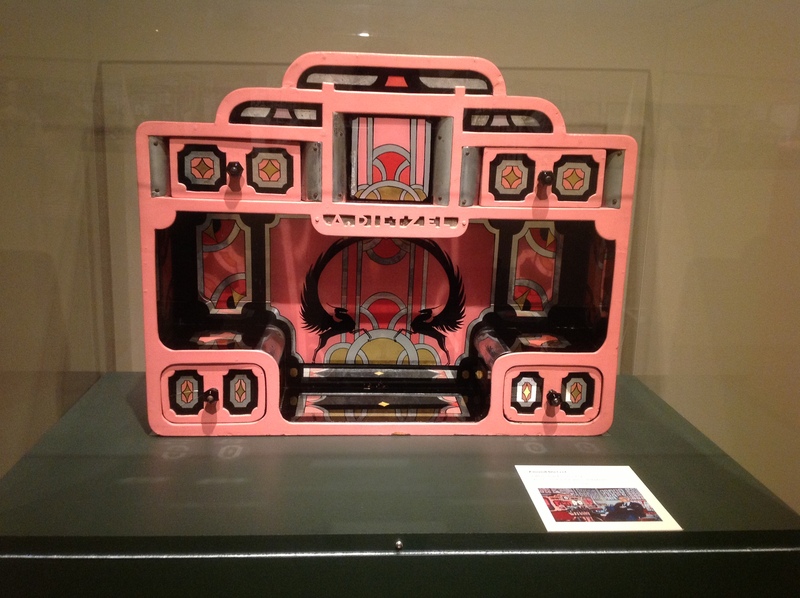 Enjoy a few more images from the exhibit (courtesy of the Milwaukee Art Museum’s press kit)! And I just wanted to give a special shout-out to my dear friend Kate, who kept my rugrat occupied when her patience with “grown up stuff” ran low. I am going to add in another possible explanation for the shift in styles in his flash – perhaps his hand was not as steady and his eyesight not as good as he aged, so he altered the flash to reflect what he could do? 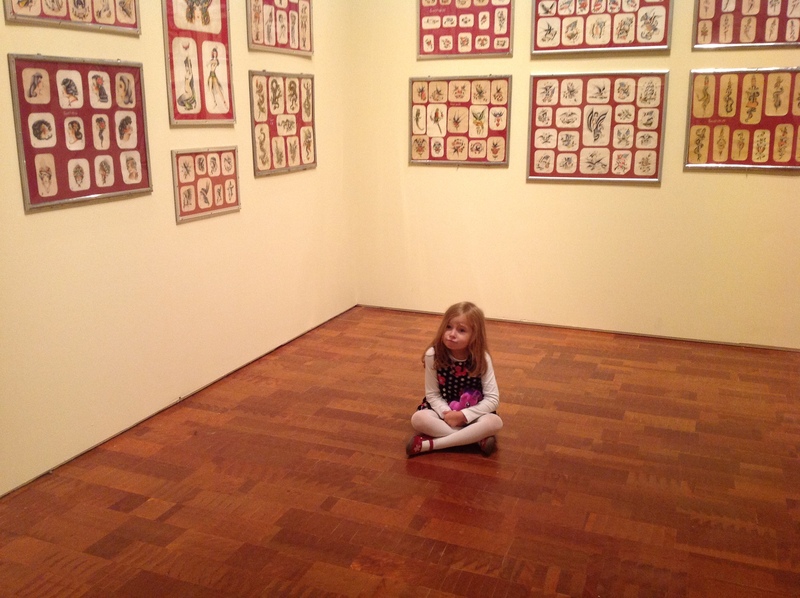 And it was super-fun hanging with The Rugrat. We had fun making art!